When looking for iPod cases and accessories you can always count on Griffin to be at the front of the pack with products. When the 4th generation iPod Touch was released Griffin was one of the first companies to offer cases. I had the opportunity to try out two of these cases. I tested the Motif Gloss (also available in Diamond pattern) and the Reveal. 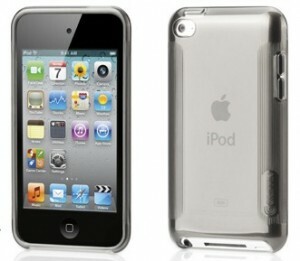 Both cases easily protect the iPod from minor falls and items in your purse, bag, or pocket. The cases cover the back and sides of the iPod with openings for the dock connector, speaker, microphone, and camera. 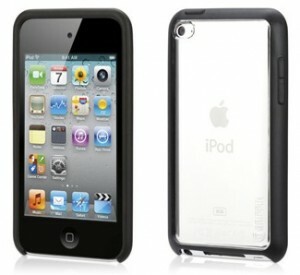 While both protect the iPod, they are two different cases. The Motif is a thicker than average flexible plastic with a brown tint to it. The thickness gives the iPod more body and actually makes it more comfortable in the hand. It also give good shock absorption in falls. It also has a nice ribbed surface where your fingers would hold it making it easier to hold. My only concern with the Motif is the thin band the goes about the dock connector from one side of the iPod to the other. While it hasn’t broken in my weeks of testing, it seems like something that could easily snap is caught on the right item. The Reveal (pictures at the top of the article) is a clear plastic case (hence the name) with a black rubber side. The rubber side is another form factor to help with falls. It looks good too. WIth the clear plastic is meant to show beauty of the metallic back of the iPod, it soon looses it’s purpose since it scratches very easily. Instead of looking at the back of your iPod you are looking at the scratched surface of the case. My case has numerous minor scratches on it, just from sitting in my pocket of iPad bag. Of course, I’d rather see the scratches on the case instead of the iPod itself. One final note that I almost forgot. Both cases come with a small two piece, easy to assemble stand for the iPod. The iPod sits on the stand for easy upright viewing. I think the stand is my favorite part of the cases. These are just two of the many cases Griffin offers for the new Touch. I would definitely recommend the Motif ad the Reveal for protecting the iPod. However, the Reveal is less desirable if you are going for looks. The prices of $19.99 and $24.99 definitely keep them in the low price range of iPod cases.